Located a 5-minute walk from Bay of Bengal, The Mercure Hotel features a rooftop restaurant with ocean views. All rooms are air-conditioned and come with a work desk. Free parking is provided. 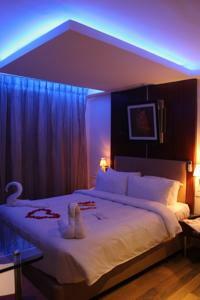 Hotel Mercure is situated in the heart of Pondicherry, a 5-minute drive from Pondicherry Railway Station. Pondicherry Airport is a 20-minute drive away. A minibar, tea/coffee-making facilities and personal safe are standard in all rooms. En suite bathrooms include free toiletries and shower facilities. A DVD player is available upon request. Sightseeing arrangements can be made at the tour desk. Laundry service is available. 24-hour room service is offered for convenience. Barbequed and grilled dishes are served in The Dragon Lounge, which overlooks the ocean. A selection of Chinese, Mediterranean and European cuisine is offered in Cucina restaurant. Free! One child under 12 years stays free of charge when using existing beds. There is no capacity for extra beds/cots in the room.